Join the club -- with Chelsea™ doll’s clubhouse! Two stories and lots of play space make the house the perfect place for young imaginations to explore. Open the pink door to welcome friends! 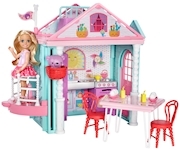 There’s a kitchen with appliances that really open, a second floor and a working elevator that has a platform for Chelsea™ doll and a basket for her teddy bear, who’s also included! Load them in and move the platform -- as it carries Chelsea™ doll up, the basket holding teddy goes down. When Chelsea™ doll rides down, her bear goes up! Furniture is included for fun new stories. A bright table and chairs with drinks and sundaes for two are a perfect clubhouse snack; and a bed on the second floor is perfect for daydreaming, stargazing and sleeping tight. Chelsea™ doll wears a skirt with white polka dots and pink sandals. Young minds will love playing out friendship stories because with Barbie®, anything is possible! Collect all of the Chelsea™ dolls and accessories for even more storytelling fun (each sold separately, subject to availability). 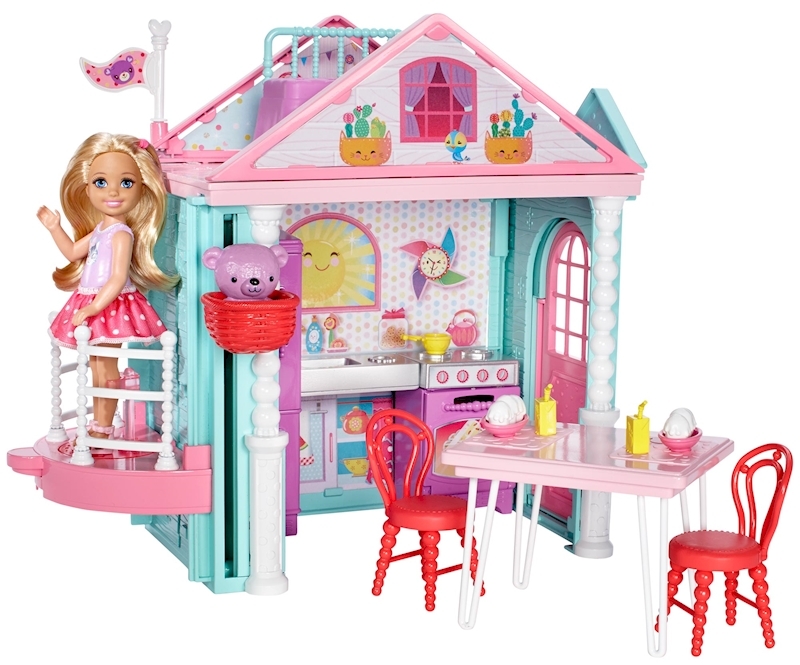 Includes clubhouse play set with working elevator, Chelsea™ doll wearing skirt and shoes, furniture, themed pieces and teddy bear. Colors and decorations may vary. Features: ? 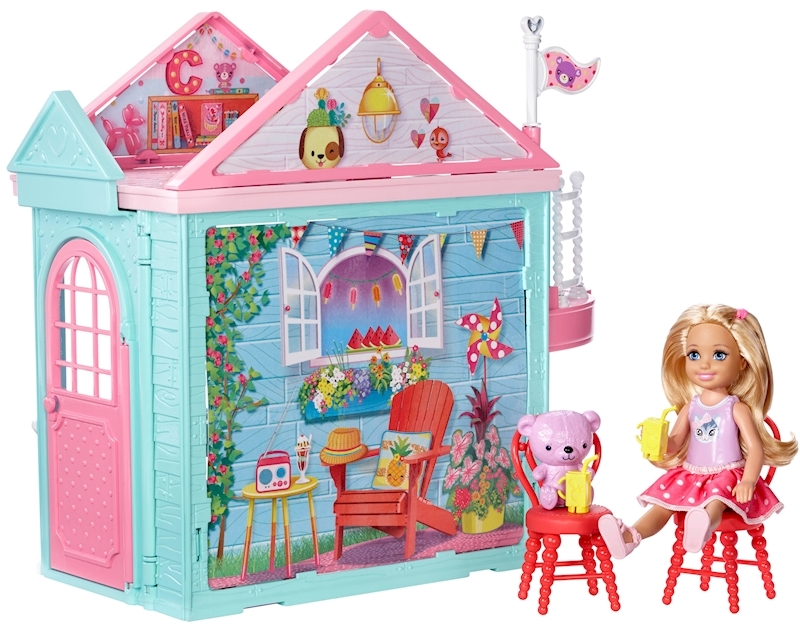 Join the club -- with Chelsea™ doll’s playhouse, Chelsea™ doll and her teddy bear! ? Two stories with a kitchen and lots of play space make the house a perfect getaway for young imaginations. ? Let your story travel between floors in the working elevator -- place Chelsea™ doll on the platform and her bear in the basket, and move the platform. As it carries Chelsea™ doll up, the basket holding teddy goes down. When Chelsea™ doll rides down, her bear goes up! ? Other working features include the front door and the doors on the kitchen appliances. ? Fun furniture expands storytelling: there’s a dining table, two chairs and a bed to arrange and rearrange. ? Smaller accessories add more play possibilities, like two sundaes, two drinks and kitchen cookware. ? Chelsea™ doll is ready for anything wearing a skirt with white polka dots and pink sandals. ? Collect all of the Chelsea™ dolls and accessories for even more storytelling fun (each sold separately, subject to availability).